The public is invited to visit The Artists’ Gallery on June 1 from 5 to 8 p.m. for light refreshments for the opening of its most recent exhibit, “From the Land of Pleasant Living,” by Jeanne Saulsbury. Jeanne’s work will be featured throughout the month of June. The Artists’ Gallery is located at 239 High Street in Chestertown and is open Tuesday through Saturday from 10 a.m. to 5 p.m. and Sundays from 12:30 to 4:30 p.m.
Jeanne paints from her studio “Shady Grove” in Ridgely. After college, she painted and studied watercolor for 25 years but switched to oils when Easton started the Plein Air Art Festival. She found that for her, oils were the answer to catching the light in and out of doors. She is a former partner of The Artists’ Gallery in Chestertown and is still an exhibitor there. 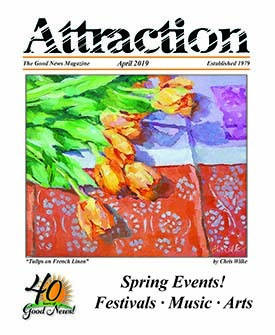 She is also past president of the Working Artist’s Forum in Easton. Jody Primoff will also be showing paintings in mixed media, acrylic, ink, and watercolor on First Friday. For many years, Jody has found the Eastern Shore to be a special source of inspiration for her work with its water vistas, enormous skies and changing weather. Come for one last look, as June will be Jody’s last month as an exhibitor with The Artists’ Gallery. Also in June, Michele Armitano’s creative work in sterling silver and semi-precious stones will be showcased as well. She was inspired by the natural beauty she found while living in Venezuela. For more information about The Artists’ Gallery, visit www.theartistsgalleryctown.com, www.facebook.com/6goodpainters or call the gallery at 410-778-2425. “Capt. 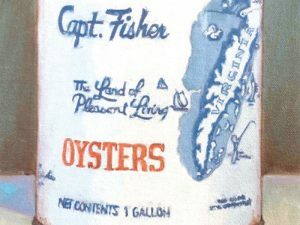 Fisher Oyster Can,” by Jeanne Saulsbury.